dSatellite is a site-specific architectural structure that extends the mission of DFLUX, a Detroit-based research studio and residency program, further into its community. DFLUX engages its local neighborhood and the general public with creative actions, research, and workshops. In so doing, they hope to reveal and create emergent and sustainable cottage industries. dSatellite was created with the intention of providing future DFLUX participants and local residents with an outpost to engage in various field research. 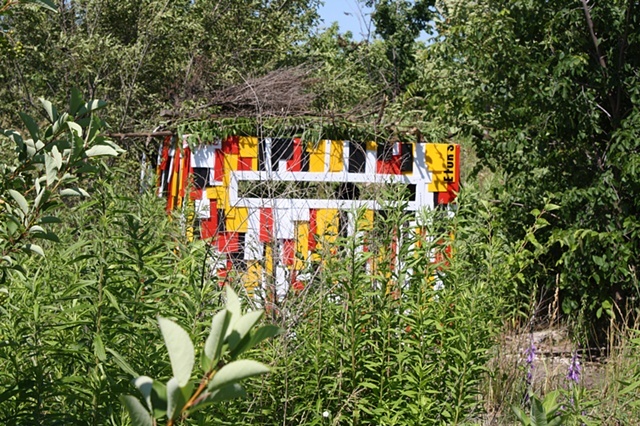 Constructed with foraged building materials, dSatellite merges both the physical and conceptual characteristics of the DFLUX Residency site and a typical nature blind used by naturalists, scientists, photographers and hunters. dSatellite is has been deployed in a completely razed residential neighborhood of Detroit currently referred to as the "field" by local residents and the "Renaissance Zone" by real estate developers. A dense urban forest, rich with wildlife, has grown there, only crumbling roads and alleys, debris piles, and public utilities remain as signs of past use.